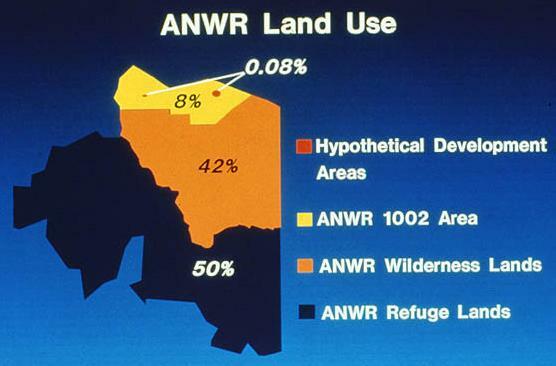 The argument about ANWR comes down to 2,000 acres. That might seem like a lot of land at first glance, but ANWR itself is roughly 19.0 million acres and 17.5 of that is absolutely permanently closed to development. And further, look at that map – it’s the northern most part of Alaska. It’s not the gorgeous part of ANWR that the media loves to show pictures of. In fact, it’s literally like a level of Hell in Dante’s Inferno. These 2,000 acres are flat, tree-less and it reaches about -110 degrees fahrenheit with wind chill during the winter. Did someone have better plans for this area? A park or tourist area? one of the bleakest, most remote places on this continent, and there is hardly any other where drilling would have less impact on surrounding life. . . . Translated into the vernacular: Common haircuts do more permanent damage than what is being proposed for going into ANWR to drill for oil. For more on domestic drilling in the OCS (Outer Continental Shelf) click here. I’ve backpacked across the “hell” you describe. I was dropped with two friends on the Arctic coastal plain and backpacked up the Aichilik river over the Brooks Range and down the other side. You should go to the coastal plain in early June. It might awe you to see wildflowers blooming all over that flat plain with the Brooks Range behind and the Arctic Sea to the front and more than 100,000 caribou nursing calves on the plain. Watch long enough and you might see wolves and grizzleys working the herds and some of the millions of migratory birds that live in the wilds of the 1002 area. The 2,000 acre myth is just that. Those 2,000 acres are NOT CONTIGUOUS, and roads and pipelines don’t count. USGS studies have shown that the oil that might underlay ANWR is in small pockets distributed throughout the 1002 area. It will require more 50 drilling stationsworking with the present best technology (4 mile drilling radius), 5 airstrips, and a number of quarries spread across more than 1.5 million acres of the coastal plain to get what little oil is there. The oil industry already has access to 94% of Alaska’s Arctic Coastal plain. ANWR is the last 6% that is protected. There is a reason it is so dense with Bear, Caribou, and other wildlife. It is wild. Is it not funny that we bulk at drilling in our own back yard with all the Greenie reasoning of ruining a pristine area. I guess the only pristine areas are in the United States because we sure lap up what is pumped from the backyards of other countries with out even wiping our chins. Let someone even hint that we cannot continue our feed and we send our children to protect the oil deposit in someone else backyard. Liberals have used the shotgun effect of WANTING alternative energies but have NEVER come up with a viable plan to get us from point A to point B. All they tell us is what we can’t do and not how we can get to weening ourselves off oil without jeopordizing the family budget, jobs, National Security and have a realistic source or sources of alternative energy when we get done. So far we have managed to lock up our own oil deposits and forced us to send our kids to die protecting others oil so we can get what we need to keep going. Using all our oil deposits gives us time to move to alternative energies, help stabilize our economy, create jobs, help family budgets, keeps our kids here to work and out of other nations oil fields, increases our security using by our own oil. I worked at Prudhoe Bay supporting the Ayleska Pipline construction, did ice drift studies on the pack with scientists, and supported a drilling rig nearest to the purposed drilling site for years as a Helicopter pilot. Hudson perpetuates the typical environment myths about ANWAR. Caribou despite environmental pinhead warnings were not bothered with any of the construction, they were more of a danger to truck drivers than the reverse. It was not unusual to see Caribou casually walking into and through the camps. Never saw a grizzly except in the Brooks range foothills, never ever down on the coastal plains. Saw pleanty of polar bears, but only either in the ice pack or in the lab at Prudhoe. I am no longer a pilot nor do I work in the oil industry so that I have no need to BS anyone. Listen to people like Hudson at your own peril. I would tend to doubt that anyone trekked the coastal area in the summer. The area basically turns into a swamp, with snow melt trapped above a permafrost zone. You could however walk up a river bed, but then you would see very little.